Jeff Bauman went from being a normal 27 year old to a double amputee and national hero in the days following the 2013 Boston Marathon. Now, Bauman is courageously sharing his personal journey during the marathon tragedy and his inspiring post recovery experiences through exclusive speaking engagements with American Program Bureau. Inspiring others to set and achieve high goals, Bauman places significance on the message that together, we are all stronger. Rather than thinking negatively about his altered life, Bauman uses his story to motivate others to overcome amazing odds. 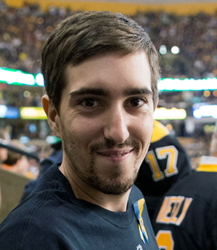 Jeff Bauman went from being a normal 27 year old Costco employee, musician and Boston sports fan to a national hero overnight. Blending in with the other tourists, friends and family members at the Boston Marathon on April 15, 2013, Bauman eagerly awaited his girlfriend who was running. As he waited, a man dressed in dark clothing appeared next to him, dropping a black backpack only feet away. Moments later, the first of two explosions shook Boylston Street, and Bauman became the face of the attack when a photo of him in a wheelchair with devastating injuries appeared everywhere. Now, Bauman courageously shares his personal journey during the marathon tragedy and his inspiring post recovery experiences through speaking engagements with American Program Bureau. Bauman lost both of his legs along with other serious wounds due to the Boston Marathon bombings. Although he suffered extreme hardships immediately after the traumatic event, he went on to identify the terrorists behind it, saving many lives. Since that tragic day, Bauman has made an amazing recovery, becoming a beacon of hope for all. Epitomizing the term “Boston Strong,” he shares his story with audiences in a moving presentation based on his 2014 memoir, STRONGER. in which Bauman reflects on his experiences at and since the marathon. Inspiring others to set and achieve high goals, Bauman places significance on the message that together, we are all stronger. Rather than thinking negatively about his altered life, Bauman uses his story to motivate others to overcome amazing odds. His firsthand knowledge of adjusting to prosthetics, experiencing extreme physical and emotional trauma, disability vs. ability and the power of determination to overcome adversity allows him to customize his speeches for healthcare audiences, colleges, nonprofits and many others. Organizations wishing to book Jeff Bauman and hear his heartwarming story of survival and courage should contact American Program Bureau at 1-617-614-1600 for information on available dates. For more information on American Program Bureau, please visit http://www.apbspeakers.com. For a profile on Jeff Bauman, please visit http://www.apbspeakers.com/speaker/jeff-bauman. Founded in 1965, American Program Bureau has long provided a vocal platform for the world’s most inspiring voices. Some of the incredible people who share their amazing personal stories of success, failure, hard work and the events that changed their lives include Grant Korgan, Josh George, Caroline Casey and Jonathan Kaufman. The global leader in the professional speaking industry, APB exclusively represents hundreds of speakers and serves thousands of clients worldwide. Today, APB represents the top thought leaders across the realms of healthcare, entertainment, business and technology including Mikhail Gorbachev, Archbishop Desmond Tutu, Richard Branson, Michael Douglas and many others.